At its inaugural Ignite Conference in Chicago, Microsoft gave business users a preview of Windows 10's enterprise-specific features and toolsets. The operating system, which is rumored to go live this summer, will feature enhanced management, security and productivity options specifically designed for the business user. Windows Update for Business is a new tool that will provide IT teams with streamlined access to recently launched security updates and features. The management application will enable IT to remotely (and quickly) install services and features on devices running Windows 10. Microsoft also made available in technical preview System Center Configuration Manager for Windows 10, which will be integrated with Windows Update for Business. 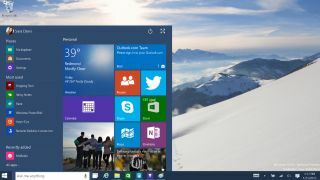 Like previous versions of this tool, the Windows 10 update gives IT teams the ability to deploy, update, manage and secure the operating system on all organizational devices. Delve users will be pleased to learn that in addition to aggregating and curating content from Microsoft applications like OneDrive and SharePoint, you will now be able to run analytics within the tool. Now, you will be able to measure, track and identify trends across your interactions with colleagues and external partners and clients. Microsoft also gave a deeper preview of SharePoint Server 2016 and Exchange Server 2016, both of which will be available for testing later in the year. The updated SharePoint Server will give companies that deploy the service in-house, but also run a cloud-based version of Office 365, access to cloud-based features. Exchange Server 2016 will feature a revamped collaboration experience, intelligent search, and a look and feel that is more in-line with Office 365. Microsoft also announced that Office 2016 and Skype for Business are now available in broad public preview. Previously, only IT professionals and developers were given access to the still-in-development productivity tools. Microsoft introduced the Azure Stack, which is designed to give organizations the option to run cloud-based Azure tools in on-premise datacenters. The new platform, which will be in preview later this summer, lets users run private, cloud-based applications that are integrated with an on-premise storage environment. SQL Server 2016 will be available to preview this summer. Microsoft has updated its database engine to include in-memory computing, new security and encryption technologies, built-in advanced analytics with the R language, and mobile BI for on-premises data, according to a Microsoft statement. Windows Server 2016 is available today for an updated preview.